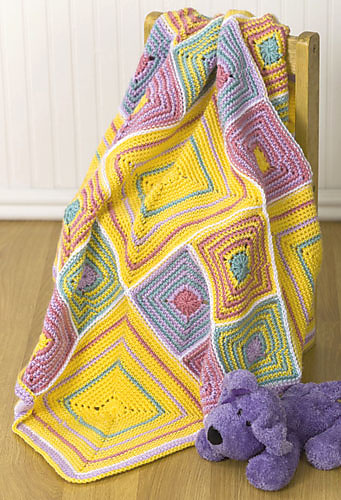 This one is a free pattern from Caron yarn, done by a really talented designer, Lisa Naskrent. 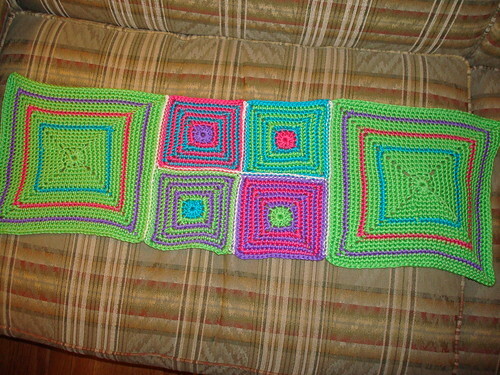 The picture shows the afghan done in baby colors in Caron Eco yarn. I have actually just started this afghan, but instead of using the pastel colors, I am using Caron Simply Soft Brites, which are, um, radiant, to say the least. My base color is green (because they were out of yellow!) with additional colors of pink, purple and aqua. I have the top 1/3 of the afghan finished. It is going really quickly, and I'm liking it so far. I'm not thrilled with the joining method, but I'm withholding judgment until I'm further along. It may be all right. (Sorry the afghan is on my plaid couch. I usually like to spread my project out on the bed (with its less distracting pattern), but PapaC is already in there reading, so it was the couch or nothing!). See how radically different it looks in these colors? 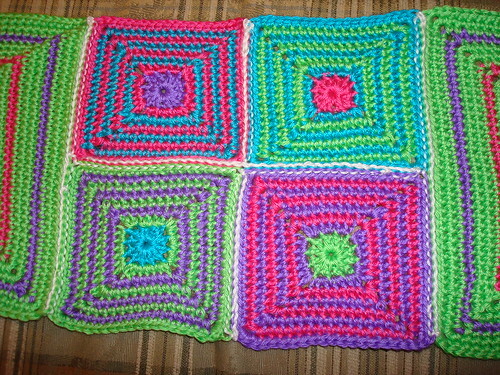 This blanket is for a special new baby coming along. More info on THAT later! pretty! i kind of like the joining. i made a pair of toddler mittens this year for a northern friend in caron ss. it is fabulous! so inexpensive and SO SOFT. This page contains a single entry by MamaT published on March 24, 2009 12:25 AM.